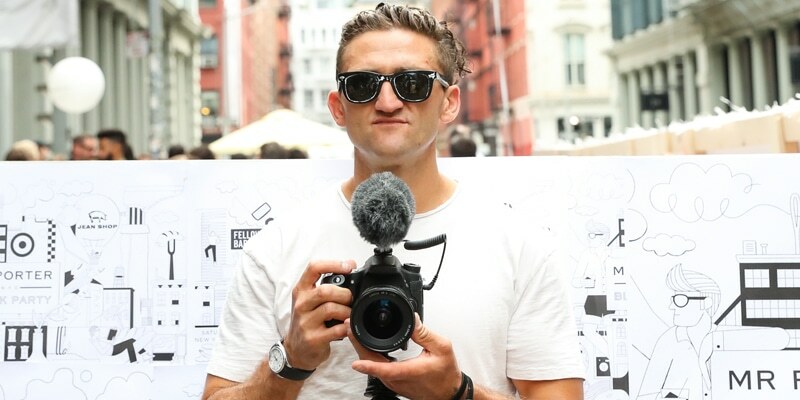 Casey Owen Neistat was born on 25 March 1981, in Gales Ferry, Connecticut USA, and is a YouTube personality, vlogger and filmmaker, known through his work on numerous films and commercials. He also one of the founders of the video sharing app Beme. How rich is Casey Neistat? As of late-2018, sources estimate a net worth that is over $16 million, earned through success in his numerous endeavors. He’s collaborated with a variety of companies, and has also made public speaking appearances. As he continues his career, it is expected that his wealth will also continue to increase. Casey dropped out of high school during his junior year, and did not come back to complete his studies. For the next few years he lived in a trailer park with his son, working as a dishwasher and a short-order cook in a restaurant in Mystic, Connecticut, before then deciding to move to New York City. In 2001, he was residing in the Tribeca neighborhood just a few blocks from the World Trade Center, when the September 11 attacks occurred. He published a vlog about the incident which led him to be hired by the media company Conde Nast, so beginning his career in filmmaking. One of his first projects was with artist Tom Sachs and Casey’s brother, making a series of films about the artist’s installations and sculptures. It wasn’t until two years later that he gained international exposure for a three-minute film called “iPod’s Dirty Secret”, which criticized Apple for not having a battery replacement program for their products. The issue continued, and was covered heavily by the media, eventually leading Apple to create a new battery replacement policy. In 2004, Neistat and his brother worked on a series of films called “Science Experiments”, which featured 15-minute films of them documenting various experiments. The project proved successful in Creative Time’s 59th Minute Program, on which it was subsequently featured. Four years later, HBO purchased an eight-episode series from them, entitled “The Neistat Brothers”, which focuses on their lives, and received mixed reviews upon its release. Eventually Casey transitioned to a new platform on YouTube, creating his first video in 2010 about using the emergency brake cord on train cars in the New York subway system. This was followed by a video explaining the website Chatroulette, and the following year he released a video criticizing the New York City Police Department’s ticketing of cyclists in the city. He also started to post daily vlogs, which he describes as more of a forum than a journal. His content earned him a GQ New Media Star Man of the Year Award, as he continued to consistently upload onto his channel. He cancelled his vlog in 2016 to focus on another project. The year before the cancellation of his blog, Casey announced that he was working on a video-sharing app project called Beme, alongside Matt Hackett. The app’s goal was to produce unedited four-second videos with users able to upload and share immediately. Shortly after its release, users had shared over 1.1 million videos with over 2.4 million reactions. In 2016, CNN announced that it would be acquiring Beme for $25 million, and the following year Hackett announced that the app would be shutting down in a few months. Casey later released a YouTube video announcing that the two co-founders had decided to sever their ties with CNN and Beme; according to the video, he and CNN reached a mutual agreement to no longer be involved. He also admitted that it was frustrating working in a team environment as a manager. He later removed this video and posted another shorter video which downplayed his earlier frustrations. In 2018, he announced that he was working on a new project entitled 368, which is advertised as a creative space for creators to collaborate. For his personal life, it is known that Neistat has a son with his then girlfriend Robin Harris – he was 17 years old at the time of his first son’s birth. In 2005 for reasons unknown he eloped with Candice Pool, and the two were married in Houston, Texas, however, a month later they got an annulment. It wasn’t until 2013 that the two became engaged again, and married in Cape Town, South Africa. They now have two children together. Pool is featured in many of Neistat’s videos. In 2011, he released a video about his grandmother who was a tap dancer and one of World War II’s Radio City Music Hall’s Rockettes. The video earned a lot of attention, but she passed away 22 days after the video was posted.